The aptly named New Song was Howard Jones' debut single, reaching #3 in the UK and Irish singles chart. 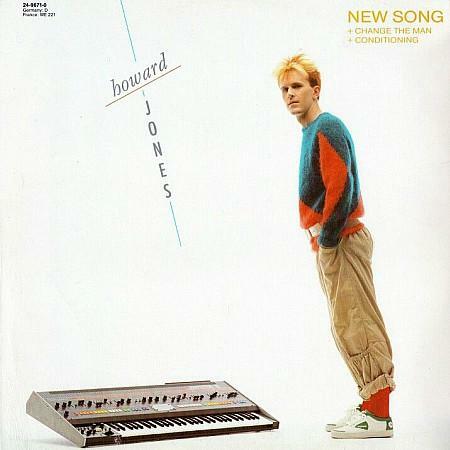 On the minimalist single sleeve (see below) you can see Howard slanting forward towards to his keyboard, hands casually placed in his pockets and wearing what looks like his Dad's jumper and some trainers. He kind of looks like a university student who woke up late and got dressed in the dark, forgetting to brush his hair. But if you were to judge Howard Jones by his messy, spiky hair and baggy clothing, rather than his songs, then you would certainly be missing out of some very accomplished work. Indeed, the lyrics of "New Song" reflect Jones' own mundane experience of working in a clingfilm factory in High Wycombe during 1977-78, and wanting to break free from the monotony - thank goodness he did! The B-side of the UK 7" featured the track "Change The Man", with the U.S. single instead featuring "Conditioning". 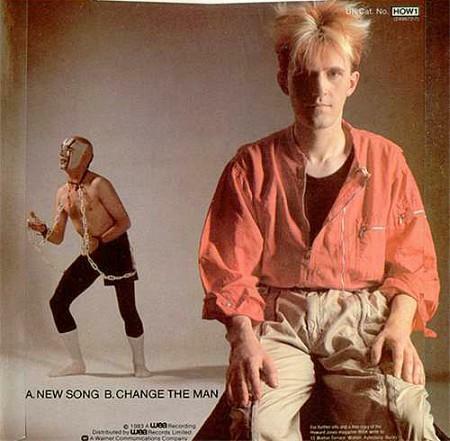 The UK 12" single included the extended 12" version of "New Song", "Change The Man", and also the original version of "Conditioning" - a new version was recorded for the album Human's Lib. The video is quite literal and represents the song's lyrics about throwing off your mental chains and breaking free from the system. It starts in a food factory producing pickled gherkins. Howard is in overalls sweeping the floor. The boss turns up in his Rolls Royce and Jones rips off his overalls, as does a dancer wearing black and white face paint who is left bare chested. Jones, the factory workers and the dancer then all pile into the Rolls Royce and drive off. The next scene sees the singer at the Holborn (Kingsway) tube station hassling and singing to passengers leaving the station. He can then be seen playing the synth break (this is my favourite section of the song) whilst still in the tube station. The dancer in chains also appears again. In the third scene, Howard is outside a building (possibly a school) with the dancer. A window cleaner up a ladder throws away his bucket and cloth, and the dancer catches the bucket with a shocked look on his face. The cleaner climbs down the ladder and dances away from the school. The video then cuts to inside a classroom where the unruly pupils are throwing paper balls at their teacher. Jones and the dancer enter the classroom and eventually lead the pupils and the teacher out of the classroom, and they all dance off into the sunset. "New Song" entered the UK singles chart at #92 on 28th August 1983 while UB40 were enjoying their first week at No.1 with "Red Red Wine". The single climbed to it's peak position of #3 for one week on the 16th Oct chart, while Culture Club were at #1 with "Karma Chameleon" and Tracey Ullman was at #2 with "They Don't Know". The following week "New Song" slipped back to #5. However, the single was still inside the Top 40 at #38 on 20th Nov, and spent a total of three and a half months (14 weeks) in the Top 100, which is a pretty decent run. The single also reached #3 in Ireland, #10 in Sweden, #15 in Switzerland and #27 in the U.S. This is a performance on Saturday Superstore, and we learn that the dancer/mime artist is called Jed.